eZeefit Full Foot Booties: Helps protect your feet from rubs and blisters! Great performance wet or dry. The unique ultra-thin memory fabric protects and insulates better than socks for active sports. Snug fitting booties retain their shape even when wet from perspiration or use in water sports. Why are they better than socks? 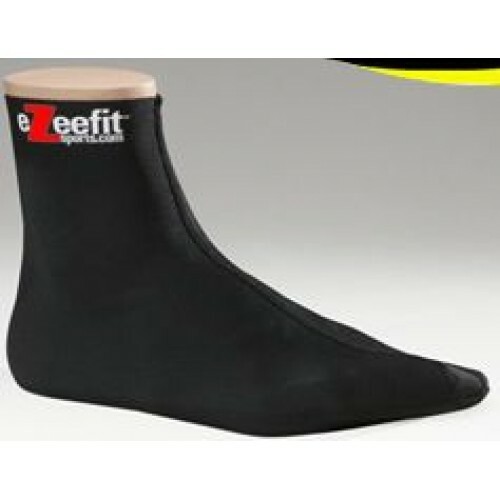 eZeefit custom ultra-thin fabric is like neoprene but super thin and supple. Never loses its shape and dries quickly. Great for wet sports, winter sports and chilly weather. Their unique insulating properties may be too warm for some sports. eZeefit Ankle Booties are best for most warm weather sports. Easy Care, just rinse and hang to dry. Easy to pull on with one hand. Protects from sand chafing and friction. Retain their shape even when wet. Hygenic for shoe sharing in crew boats. Dry right on your feet. Easier than shoe covers to put on.